Metal Restoration – Wood effect for dashboards, door cappings and window surrounds. Hand painted wood effect, for vintage and classic cars with exposed metal interior areas. Burr walnut wood effect hand painted on the metal dashboard of a 1930 Renault Monaquatre. 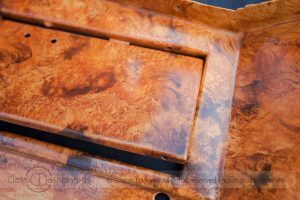 Are you looking to have a wood effect for your car’s interior but it is of metal origin? Burr Walnut and sometimes other styles can be applied on any item. Dashboards, door-cappings, window surrounds and even the interior wheel arches can have a wood effect that is indistinguishable from the real wood. 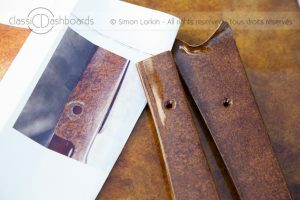 This is a skill that Simon has developed over time with over 30 years experience working with wood and veneers within his antique furniture restoration. His skill in replicating wooden veneer is quite incredible and his clients have, without exception, been thrilled with the result. 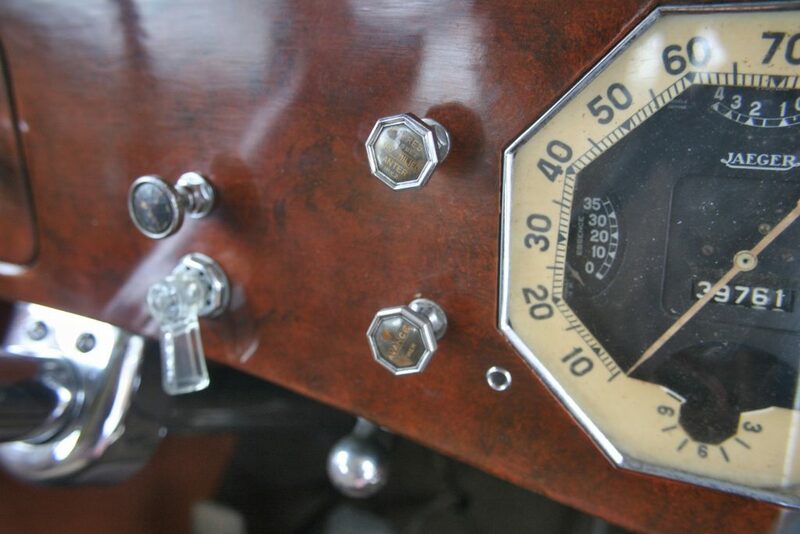 Yes, this really is a metal dashboard with a hand painted burr walnut wood effect, by Simon Lorkin. 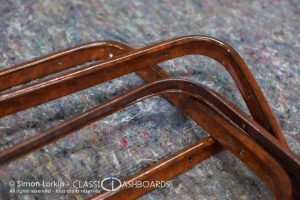 After the painted the wood effect is complete the same methods to finish the items are used as when restoring wooden dashboards. That include a water-based UV safe lacquer in many micron thin coats to achieve a fine finish that ‘isn’t too thick or plasticky’. Sometimes a client gives Simon the ‘challenge’ to try and replicate an original wood effect based on only a photo, like these items for a Lancia of which there are only two of these cars left in France. 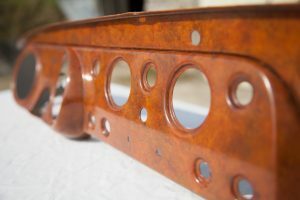 Simon was asked to replicate the original colours and style of wood effect from a photo taken of the other car’s dashboard on a part that had been hidden from sunlight underneath. Do you own a beautiful Facel Vega? If yes, please click here to discover my page specifically dedicated to Facel Vegas.